QA1 Trailing Arms - Lightning Motorsports - Selling Speed since 1996 ! With three styles to choose from, rectangular, tubular and adjustable, you are sure to find the trailing arms that fit your ride. All trailing arms are powder-coasted gloss black for a long lasting finish. 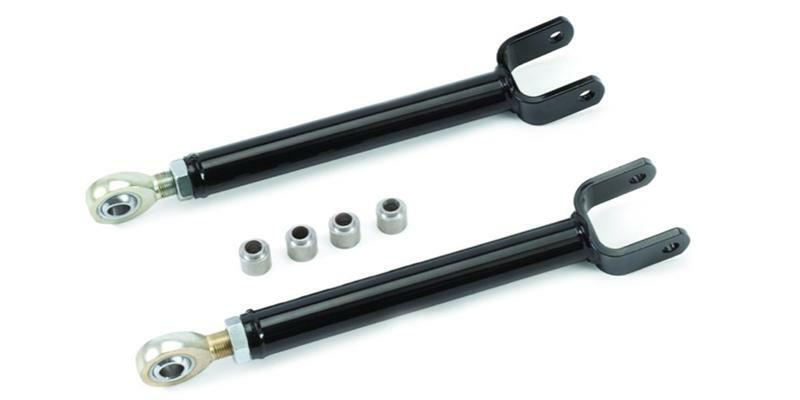 All upper tubular and lower rectangular trailing arms use polyurethane bushings on both ends, while upper adjustable and lower tubular trailing arms use a spherical ball or rod end assembly on the chassis end to eliminate bushing bind, allowing the suspension to move smoother for better control. This keeps the tires planted firmly on the ground for improved traction and a more predictable, better handling car. Rectangular Trailing Arms are constructed from 0.120” wall cold rolled steel tubing for maximum strength and flex elimination. These trailing arms have fluted, greasable, graphite/polyurethane bushings, which are superior to the stock rubber bushings. Tubular Trailing Arms are constructed from 1-1/4” diameter, 0.120” wall steel tubing which offers increased strength over other designs, but also have the added advantage of lighter weight. Heavy-Duty Adjustable Trailing Arms allow easy rear suspension adjustments for optimum handling and traction. They can be adjusted without removing the arms from the vehicle. Simply loosen the jam nuts and adjust the pinion angle. Spherical ball assembly with Delrin® bushings allows rear suspension to move more freely. Includes graphite/polyurethane differential bushings to replace soft OE differential bushing. These brackets lower the mounting point of the rear trailing arms. A must for lowered vehicles; they correct the trailing arm angle while lowering the instant center of the vehicle, which improves forward bite and eliminates rear squat during hard acceleration. Two non-stock mounting locations are available in addition to the stock location and they will accept QA1, OEM or any other aftermarket lower trailing arms on the market. Grade 8 hardware is included; welding is required for installation. These kits replace factory hardware with new bolts, A/N washers and nylock nuts. All parts sold in pairs.